Scientific Aims and Scope : Biochemical and Cellular Archives – publishes original full length full length research papers, short communications and review articles in all areas of agricultural, biological and medical sciences. Emphasis will be given to manuscript which present novel finding pertinent to the biochemical basis of cellular structure and function as well as mechanism of cellular organelles. Investigations directed towards electron microscopy and localization of biomolecules in cells / tissues are particularly encouraged. The articles for the following broad areas of biological sciences will be considered for publications: ● Cellular Structure, Physiology and Biochemistry. ● Bacteriology, Virology and Toxicology. ● Light and electron microscopy and histochemistry. ● Immunology and molecular biology. ● Pathology. Author is expected to be a subscriber of the Journal. Yadav P R (1992) Histological evidence on the secretory activity of the accessory salivary gland of Lethocerus indicus Lep. & Serv. (Belostomatidae – Heteroptera). Proc. Natl. Acad. Sci. India 62 (B) II, 285-287. Shek P N and Barber R F (1988) Liposomes: binary antigen drug carriers for immunomodulation. In : Liposomes as Drug Carriers (ed. Gregoriadis G), John Wiley and Sons Ltd., pp. 145-157. 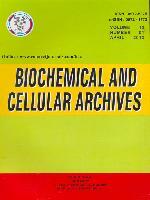 The names of the journals must be abbreviated according to the 'World List of Scientific Periodicals'. References need be strictly in the format and style of the Journal. The illustrations and graphs should be made in black ink. Photographs should be selected only to illustrate something that cannot be adequately displayed in any other manner. They should be sufficiently enlarged on glossy paper. Coloured photographs will be printed at an extra cost. Magnification should be given in actual terms. A copy of each illustration is needed. Scrutiny of the manuscript: All the papers submitted for publication in Biochem. Cell. Arch. Will be reviewed by atleast one referee and his/her decision shall be final. However, Chief Editor retains the right to accept or reject the article. The final decision regarding the manuscript shall be communicated to the corresponding author within 2 months from the date of receipt of the manuscript. Reprints : No gratis reprints are available and the authors have to bear the cost of minimum 25 reprints.